HILLARY CLINTON’S BIGGEST CAMPAIGN BUNDLERS ARE FOSSIL FUEL LOBBYISTS | "Global Possibilities"
Clinton’s top campaign financiers are linked to Big Oil, natural gas and the Keystone pipeline. WASHINGTON — Nearly all of the lobbyists bundling contributions for Democratic presidential candidate Hillary Clinton’s campaign have at one time or another worked for the fossil fuel industry. The company has lobbied hard in Washington and maintains close ties to the Obama administration. The company won the first approval to export gas to countries outside of U.S. free-trade agreements. The company is seeking approval to open additional terminals to export LNG, and will likely need a friend in the White House come 2017. Aside from lobbyists currently working to advance fossil fuel interests, there is one Hillblazer bundler — the name for Clinton boosters raising more than $100,000 — who stands out. Clinton’s position on Keystone XL — or lack thereof — may prove the biggest challenge for her in gaining support from progressive activists. Whether to grant a permit for the leg of the pipeline that crosses the Canadian border into the U.S. is up to the State Department, which has been considering it since Clinton’s time as secretary of state. 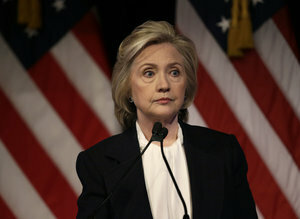 In October 2010 remarks, Clinton said the department was “inclined” to sign off on the pipeline, a statement that enraged environmental groups working to stop it. On the campaign trail, Clinton has largely evaded questions about the pipeline.